Angiogenesis Panel 1 (human) measures 7 biomarkers which are proangiogenic proteins: VEGF-A, VEGF-C, VEGF-D, Tie-2, Flt-1, PlGF, and FGF (basic):. Angiogenesis is essential to the the process of neovascularization under both physiological conditions and pathological conditions, including cancer, diabetic retinopathy, rheumatoid arthritis, and ischemia. Angiogenesis is modulated by initiatory and inhibitory molecules. Angiogenic markers are potential prognostic markers for disease activity and indicators of response to chemotherapy. Several different strategies have been designed to target vascular endothelial growth factor receptor (Flt-1/VEGFR) signal transduction. Several VEGF-neutralizing antibodies have been successful in combination with chemotherapy in limiting angiogenesis and tumor progression. Other strategies to target the VEGF/Flt-1 pathway include soluble VEGFRs (Traps), receptor tyrosine-kinase inhibitors that target VEGFR2/Flk-1, and neutralizing aptamers. The Angiogenesis Panel 1 (human) Kit provides the assay-specific components for the quantitative determination of VEGF-A, VEGF-C, VEGF-D, Tie-2, Flt-1, PlGF, and FGF (basic). 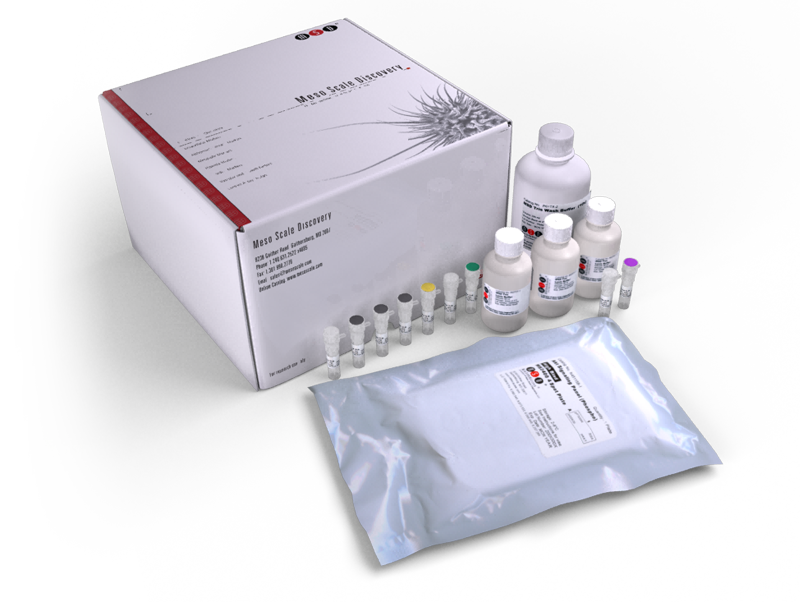 This kit may be used for the analysis of all or any combination of these biomarkers in human serum, plasma, cell supernatant, cerebral spinal fluid, urine, and cell lysate. A phase II and biomarker study of ramucirumab, a human monoclonal antibody targeting the VEGF receptor-2 in patients with advanced hepatocellular cancer. Elevated sputum Interleukin-5 and submucosal eosinophilia in obese severe asthmatics.